Posted January 26, 2009 by Tom Thumb. Late at night, over a spliff and candlelight, travelers everywhere find themselves in deep conversations about how to save the planet – now there’s finally an answer. 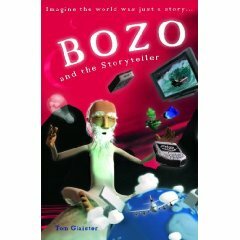 Bozo and the Storyteller is a novel for anyone who never really grew up. Our world is nothing more than a Story, it seems and the Storyteller himself is dying – the book asks what hope there might be for a Cure? And why is Road Junky running a story about a fantasy novel? Because I wrote it and one of the bonuses of being the editor is I get to plug my side projects once in a while. So be a pal and buy a copy. Or go and check out the free audio book which you can stream or download. Backpackers fill their backpacks with hi-tech devices that leave the third world locals gaping… but can technology improve travel?